She is a mother of a young daughter , she has got a full time job developing video games at Electronic Arts. But more importantly in this context, she is a crafted cellist, playing with Metal bands like Neurosis, OM, Today is the Day and others. She was involved in Amber Asylum, and she is currently a founding member of Grayceon, and also a member of Giant Squid, founded by her partner, guitarist AJ Gregory. Grayceon were formed in 2005, Jackie on electric cello/vocals, Max Doyle on guitar/vocals, and Zack Farwell on drums. It’s definitely (progressive) metal but with a twist, Jackie vocals and emotional almost melancholy cello playing, ensure that there is something very rare about Grayceon. Giant Squid is a post-metal band formed in 2002. 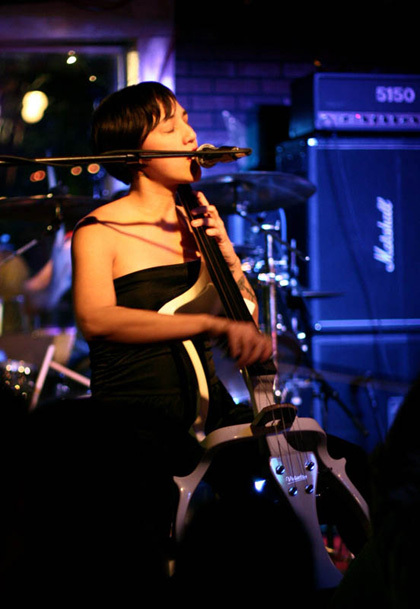 Jackie Perez Gratz joined Giant Squid in January 2007 as both vocalist and cellist. The band plays a dark and mysterious heavy, reaching in a multitude of directions, sometimes with a distinctly Middle-eastern sound. Jackie has also collaborated with Amber Asylum, a San Francisco based music group that serves as a platform for composer, singer, and multi-instrumentalist Kris Force, creating a classical inspired music, dark ambient with classical instruments like violin and cello dominant.